William I., King of England, surnamed the Conqueror, was born in 1027 or 1028. 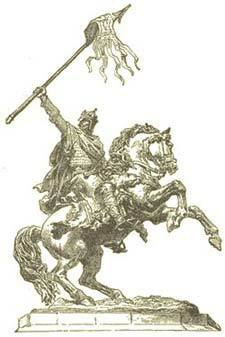 He was the son of Robert, Duke of Normandy and Herleva, daughter of Fulbert, a tanner of Falaise. When he was about seven years old his father, intending to go on pilgrimage and having no legitimate sons, proposed him as his heir. The great men of the duchy did homage to the child, and a year later (1035) his father's death left him to make good his claim. Anarchy was the natural result of a minority. William's life was on more than one occasion in danger, and several of his guardians perished in his service. At the earliest possible age he received knighthood from the hands of Henry I. of France, and speedily began to show signs of his capacity for government. In 1042 he insisted that the "truce of God" should be proclaimed and observed in Normandy. When he was about twenty years old his authority was threatened by a general conspiracy, which spread through the western half of his duchy. An attempt was made to seize him at Valognes, and he only escaped by riding hard all night to his own castle at Falaise. Bessin and Cotentin, the most Norman parts of Normandy, rose in rebellion. William sought and obtained aid from King Henry, and completely defeated the rebels at Val-es-Dunes near Caen (1047). The battle was but a combat of horse, but it decided the fate of the war and left William master of his duchy. The debt which he owed to Henry was repaid next year. War broke out between Geoffrey, Count of Anjou, and Henry (1048), and William came to his suzerain's assistance. Alencon, one of the chief border fortresses between Normandy and Maine, which had received an Angevin garrison, was captured by the duke. The inhabitants had taunted him with his birth, and William, who had dealt leniently with the rebels after Val-es-Dunes, took a cruel revenge. Soon afterward Domfront, another important border fortress, fell into his hands. In 1051 William visited England. Two years later he married Matilda, daughter of Baldwin, Earl of Flanders, and a descendant of Alfred. The marriage had been forbidden by a council at Rheims as uncanonical, and was opposed by Lanfranc, Prior of Bec. This produced a quarrel between Lanfranc and William, who ravaged the lands of the abbey and ordered the banishment of its prior. Lanfranc, however, soon came to terms with the duke, and engaged to obtain a dispensation from Rome, which, however, was not granted till 1059. Strengthened by this alliance with Flanders, William showed himself more than a match for all his enemies. Henry, who had hitherto been for the most part friendly, now turned against him. After the suppression of some isolated revolts, William was threatened in 1054 by a great confederacy. His dominions were invaded by the forces of the French king, in combination with those of Geoffrey of Anjou, Theobald of Blois, and others. William remained at first on the defensive; then, falling suddenly on one of the French armies at Mortemer, in the north-eastern corner of his duchy, he cut it to pieces. This blow put an end to the war; Henry made peace (1055), and William took the opportunity of extending his dominions in a southerly direction. He built fresh fortresses and exacted homage from Count Geoffrey of Mayenne. In 1058 Henry and Count Geoffrey made a final effort to crush their dangerous neighbor; but the effort failed, like those which preceded it. William again allowed the allies to enter and ravage his territory; but, while the French army was crossing the Dive at Varaville, he attacked and completely destroyed their rear-guard, which was cut off from the van by the advancing tide. Henry again made peace, and soon afterward died (1060). The death of Geoffrey of Anjou in the same year relieved William of his most formidable rival for the possession of Maine. Herbert Wake-Dog, the lawful ruler of that territory, who had been dispossessed by Geoffrey, recovered his dominions on the latter's death. He at once "commended" himself to William, thus making the duke his heir. On his death in 1063, William took possession of Le Mans and the county of which it was the capital-an acquisition which extended his southern frontier nearly to the Loire, almost severed Brittany from the rest of France, and paved the way for the subsequent junction with Anjou. It was apparently soon after this event, in the year 1064, that Harold, then Earl of Wessex, visited Normandy, and, according to legend, was entrapped into an oath to support William as heir to the English throne. When Harold was elected and crowned King of England (1066), William's first step was to send an embassy to him demanding the fulfilment of his promise. The purport of the demand is as uncertain as that of the pledge; but, whatever it was, Harold rejected it. The duke thereupon summoned a council of his supporters, who advised him to call together an assembly representing the whole duchy. This assembly, a typical feudal parliament, met at Lillebonne. While acting together it appears to have opposed the scheme for the conquest of England which William laid before it, but its members were won over singly. He then made a compact with Tostig, the banished brother of Harold; he came to terms with the Emperor Henry; he conciliated Philip, King of France, by offering to hold England as his vassal; and-most important of all-he obtained the sanction of Rome. Pope Alexander II., not only issued a bull declaring William to be the rightful heir to the throne, but sent him a ring and a banner as symbols that the blessing of heaven was on his claim. Embarking at St. Valery, William landed, on 28th of September, at Pevensey. 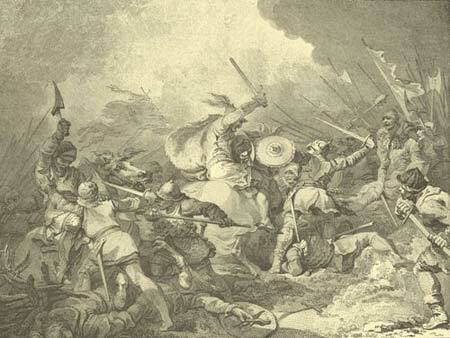 The battle of Senlac or Hastings (October 14, 1066), was a decisive victory for the Duke of Normandy; but it took five years more to complete the conquest of England. Early in 1067 William made a progress through the eastern and central parts of his new dominions. All that had as yet submitted to him was comprised in the old kingdoms of Wessex and East Anglia, and a small portion of Mercia. He at once secured his hold over these districts by the erection of fortresses in London, Norwich, and elsewhere. He received homage from the great men; he confiscated the lands of those who had resisted him; and, while keeping a large number of manors for himself, he granted others to his followers. Even those who had not resisted were regarded as having legally forfeited their title and had to submit to a re-grant on less advantageous terms. In March, 1067, William returned to Normandy, taking with him as hostages the Earls Eadwine, Morkere, and Waltheof. The revolts which broke out in the north and southwest compelled him to return to England in December. Early in 1068 he marched on Exeter, as the centre of the western revolt. He took the town and built a castle, after which he subdued Cornwall, and then marching northward forced Bristol to submit. In the summer of 1068 there was a general rising of the North, of which Eadgar was the nominal head; but Eadwine and Morkere were the moving spirits. The insurgents were aided by Malcolm, King of Scotland. William had, however, only to show himself in order to put down the insurrection. He journeyed northward, by way of Warwick and Nottingham, to York, received the submission of Eadwine, Morkere, and Malcolm, and returned by way of Lincoln and Cambridge. His march was accompanied by heavy confiscations, and great castles, rising in places of vantage, rendered the Norman power at once visible and secure. In the spring of 1069 a fresh revolt broke out. Robert of Comines, the newly appointed Earl of Northumberland, was slain at Durham; a Danish fleet entered the Humber, and a Danish army, joined by Eadgar and Waltheof, seized and burned York. The sons of Harold attacked Devon, while other isolated outbreaks took place in the west. These were speedily put down by William's lieutenants; and in the autumn the king himself, going northward a second time, recovered York, and harried Northumberland with ruthless deliberation. Returning to keep Christmas at York, he set out again in January, 1070, to oppose Malcolm, who had crossed the border in aid of the insurgents. He forced Waltheof to submit, and drove the Scottish king back into his own country; then, marching over pathless fells in the depth of winter, he reached Chester, took the town, and founded another castle. Northumbria, exhausted and ruined, gave up the struggle, and the omission of the northern counties from the Domesday survey throws a grim light on the completeness of the Conquest. In one district only, the fens of Cambridgeshire, where Hereward still held out, the spirit of resistance survived. In April, 1071, William arrived at Cambridge and commenced a regular blockade. Advancing cautiously by means of a causeway through the fens, he entered Ely in October, and therewith the last flicker of independence died out. The conquest of England was completed. To guard against any fresh incitements to rebellion from Scotland, William in 1072 invaded that country and forced Malcolm to do him homage-an event which had an important effect on the subsequent relations of the two countries. Henceforward such trouble as William met with came, not from the English, but from his Norman vassals or his own family. In 1073 the citizens of Le Mans took advantage of his absence to set up a "commune," and invited Fulk of Anjou to protect them. William was soon in the field, this time assisted by English troops. He harried the country, recovered Le Mans, and made an advantageous peace with the count. By a skilful compromise he recognized Fulk as overlord of Maine, but kept actual possession of the district, for which his son Robert did homage. A year later a formidable revolt broke out in England. Two of William's great vassals, Ralph, Earl of Norfolk, and Roger, Earl of Hereford, rebelled, and a Danish fleet, probably in alliance with them, appeared in the Humber. William returned at once to England and put down the insurrection. A great meeting of the witan was summoned to try Roger and Waltheof, for the latter, though he took no part in the rebellion, had undoubtedly been privy to it. Roger was imprisoned for life and Waltheof was condemned to death. This was the last instance of opposition to William in England; but the remaining ten years of his life were occupied with almost continuous troubles on the Continent. In 1076 he was engaged in a war with Brittany, which the interference of Philip of France forced him to bring to an unsuccessful conclusion. Next year he quarrelled with his son Robert. Matilda took the young man's side against her husband, and Philip lent him his assistance. In 1080 William was at open war with his son. While besieging him at Gerberoi he received a wound and was forced to raise the siege. A temporary reconciliation followed, soon to give way to another and a final quarrel. Three years later Matilda died, and troubles thickened upon William. A rebellious vassal, Hubert of Beaumont, seems to have held him at bay for nearly three years. Rival claims to Vexin, a district on the eastern frontier of Normandy, involved him in another war with France. He was growing old and weary, and, as he lay sick at Rouen in the summer of 1087, the French army harried his territories with impunity. When he had recovered sufficiently to take the field, he invaded Vexin and burned the town of Mantes. But his horse, plunging in the burning cinders, inflicted on him an internal injury, which proved his death-wound He was carried to St. Gervais, where, on September 9, 1087, he died. His body was conveyed to Caen and buried in the great minster which he had built. The career of William as a warrior and conqueror occupies of necessity the largest space in his life; but his fame as a statesman and administrator is not less than that which he won on the battle-field. This is not the place to discuss the results of the Conquest, but the policy of the Conqueror in regard to Church and State cannot be overlooked. An orthodox churchman, a supporter of union under the successor of Peter against the schismatic tendencies of the English Church, he nevertheless repelled any claim on the part of Rome to interference with his political sovereignty. He allowed Peter's pence to be collected, but refused to pay tribute to the Pope. While recognizing him as head of the Church, he declined to hold his kingdom as his vassal, nor would he permit papal bulls to enter England or excommunications to be issued against any of his subjects without his leave. He controlled all appointments to important ecclesiastical dignities; he made laws for the Church; he dealt justice to ecclesiastics, high and low, in his own courts. At the same time he had no desire to humiliate the Church; on the contrary, he sought to elevate it to a higher position in the State, to make it a more potent agent of civilization. A weaker statesman might have seen his own advantage in encouraging the rivalry between Canterbury and York; William strengthened the Church by forcing the younger to give way to the elder see. With the same object, that of increasing the efficiency of ecclesiastical organization, he severed the temporal and spiritual jurisdictions and furthered the enforcement of clerical celibacy. Finally, the trust which he reposed in Lanfranc from the time of his appointment to the see of Canterbury in 1070 shows not only his insight into character but his respect for the head of the English Church. In regard to temporal affairs William was rather an administrator than a lawgiver. His reign is not marked by a series of legislative acts like those of Henry II. or Edward I.; but his work was the indispensable preliminary to theirs, for a strong monarchy was the first requisite of the state. To establish the power of the crown was William's principal care. The disintegrating tendencies of feudalism had already been visible under the Anglo-Saxon kings. William, while he established fully developed feudalism as a social, territorial, and military system in his new dominions, took measures to prevent it from undermining his own authority. He scattered the estates of his great vassals, so as to hinder them from building up provincial principalities; he maintained the higher popular courts against the encroachments of manorial jurisdictions; he prevented the claims of feudal lordship from standing between himself and the mass of his subjects, by exacting an oath from every landholder at the meeting of Salisbury plain; finally, by the great survey which resulted in "Domesday Book" he not only asserted his right to make a general inquisition into property, but laid the firm basis of knowledge which was indispensable to centralized government and taxation. The care which he took to maintain English laws and institutions is part of the same policy. He balanced the two nationalities over which he ruled, and obliged each to depend upon him as its leader or protector against the other. He ruled as an English king; his feudal council was the witenagemot with a new qualification; but at the same time he was lord of the land as no king had been before him, and he enjoyed not only all the income of his predecessors but in addition all the dues which came to him as feudal sovereign. He was thus perhaps the strongest and most absolute monarch that has ever sat upon the English throne. In character William was stern, self-reliant, and imperious in a high degree. He was not naturally cruel; but he was ruthless if it served his purpose, and could take pitiless vengeance for an insult or a wrong. He was too strong to prefer deceit when force would serve as well, but his diplomacy was subtle and guileful, and no scruple turned him aside from his aim. His temper, originally forgiving, was soured by opposition toward the end of his life, and his tyrannical tendencies were strengthened by the long exercise of uncontrolled power. His passionate devotion to the chase is only too clearly shown in the harshness of his forest laws. In private life he displayed domestic virtues, and his fidelity to his wife was exceptional in the annals of his house and time.